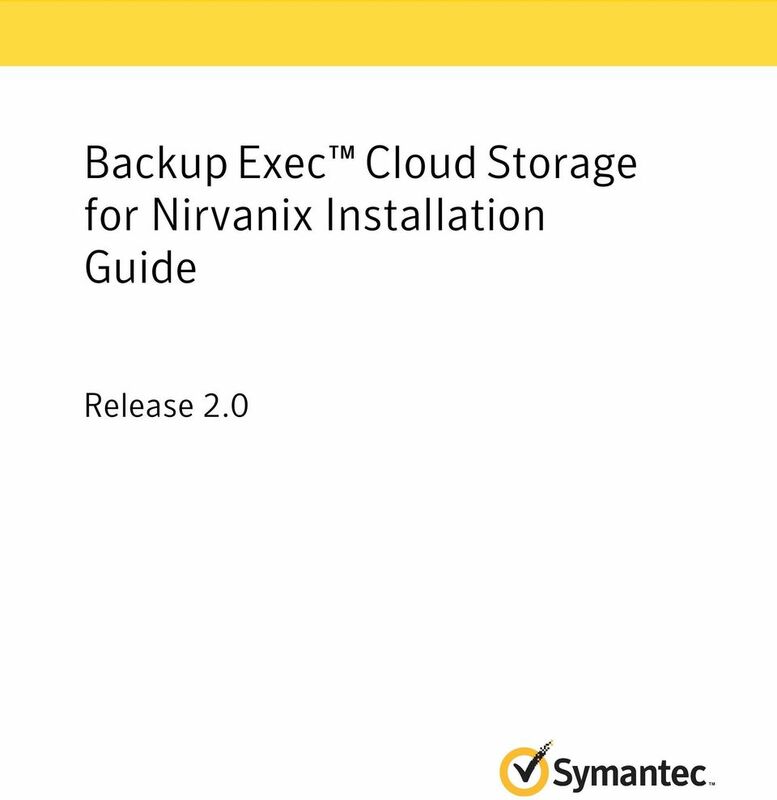 Download "Backup Exec Cloud Storage for Nirvanix Installation Guide. Release 2.0"
2 The software described in this book is furnished under a license agreement and may be used only in accordance with the terms of the agreement. Documentation version: 2012 Legal Notice Copyright 2012 Symantec Corporation. All rights reserved. 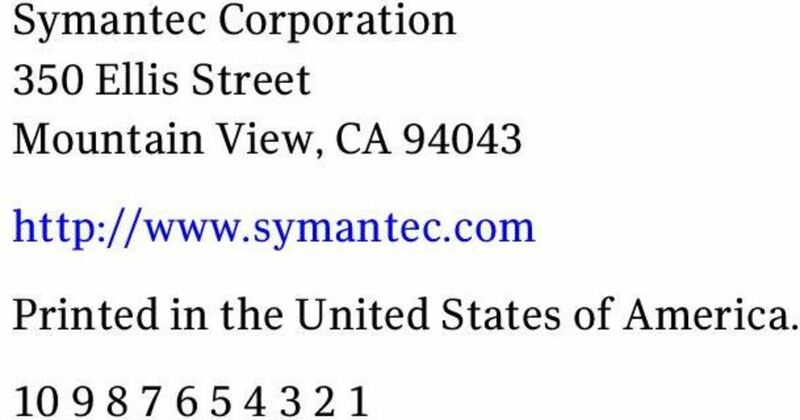 Symantec and the Symantec Logo are trademarks or registered trademarks of Symantec Corporation or its affiliates in the U.S. and other countries. Other names may be trademarks of their respective owners. This Symantec product may contain third party software for which Symantec is required to provide attribution to the third party ( Third Party Programs ). Some of the Third Party Programs are available under open source or free software licenses. The License Agreement accompanying the Software does not alter any rights or obligations you may have under those open source or free software licenses. 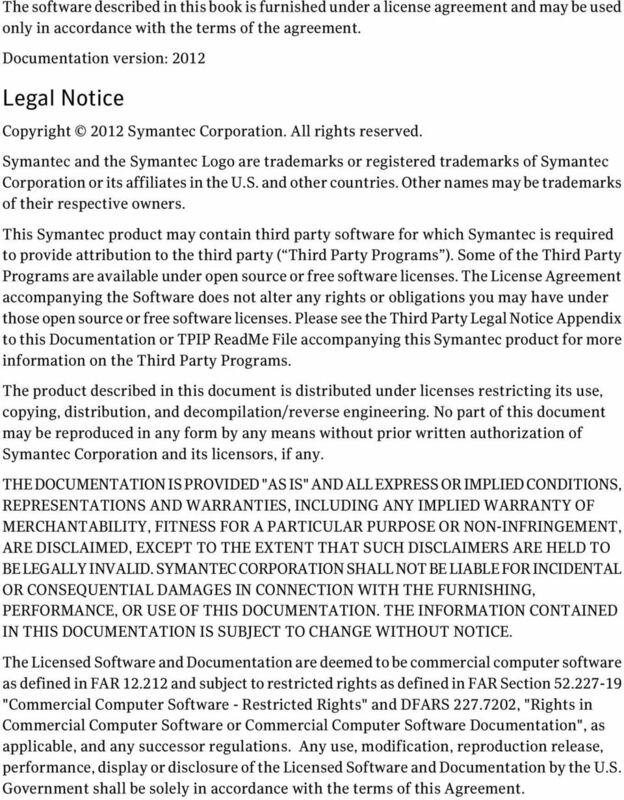 Please see the Third Party Legal Notice Appendix to this Documentation or TPIP ReadMe File accompanying this Symantec product for more information on the Third Party Programs. The product described in this document is distributed under licenses restricting its use, copying, distribution, and decompilation/reverse engineering. No part of this document may be reproduced in any form by any means without prior written authorization of Symantec Corporation and its licensors, if any. THE DOCUMENTATION IS PROVIDED "AS IS" AND ALL EXPRESS OR IMPLIED CONDITIONS, REPRESENTATIONS AND WARRANTIES, INCLUDING ANY IMPLIED WARRANTY OF MERCHANTABILITY, FITNESS FOR A PARTICULAR PURPOSE OR NON-INFRINGEMENT, ARE DISCLAIMED, EXCEPT TO THE EXTENT THAT SUCH DISCLAIMERS ARE HELD TO BE LEGALLY INVALID. SYMANTEC CORPORATION SHALL NOT BE LIABLE FOR INCIDENTAL OR CONSEQUENTIAL DAMAGES IN CONNECTION WITH THE FURNISHING, PERFORMANCE, OR USE OF THIS DOCUMENTATION. THE INFORMATION CONTAINED IN THIS DOCUMENTATION IS SUBJECT TO CHANGE WITHOUT NOTICE. The Licensed Software and Documentation are deemed to be commercial computer software as defined in FAR and subject to restricted rights as defined in FAR Section "Commercial Computer Software - Restricted Rights" and DFARS , "Rights in Commercial Computer Software or Commercial Computer Software Documentation", as applicable, and any successor regulations. Any use, modification, reproduction release, performance, display or disclosure of the Licensed Software and Documentation by the U.S. Government shall be solely in accordance with the terms of this Agreement. 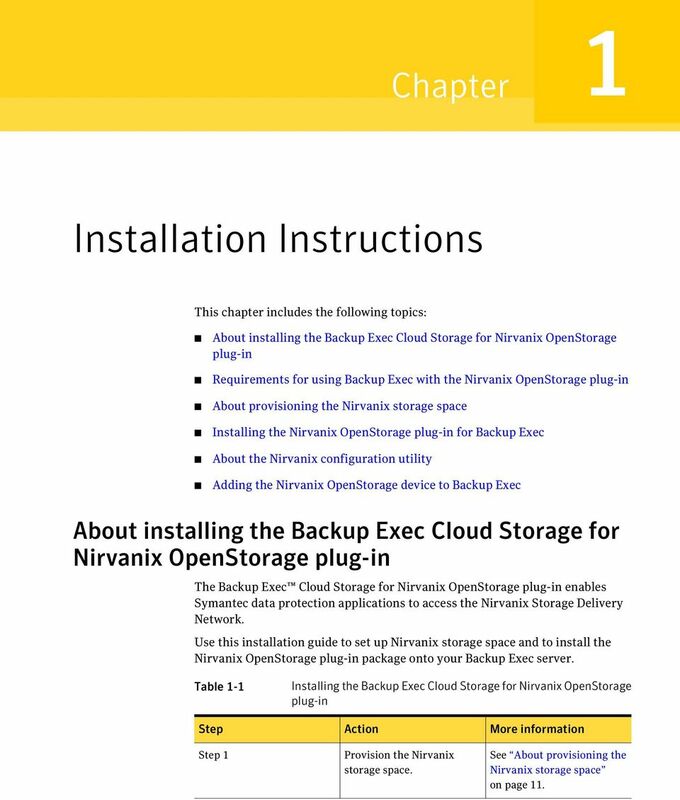 9 Chapter 1 Installation Instructions This chapter includes the following topics: About installing the Backup Exec Cloud Storage for Nirvanix OpenStorage plug-in Requirements for using Backup Exec with the Nirvanix OpenStorage plug-in About provisioning the Nirvanix storage space Installing the Nirvanix OpenStorage plug-in for Backup Exec About the Nirvanix configuration utility Adding the Nirvanix OpenStorage device to Backup Exec About installing the Backup Exec Cloud Storage for Nirvanix OpenStorage plug-in The Backup Exec Cloud Storage for Nirvanix OpenStorage plug-in enables Symantec data protection applications to access the Nirvanix Storage Delivery Network. 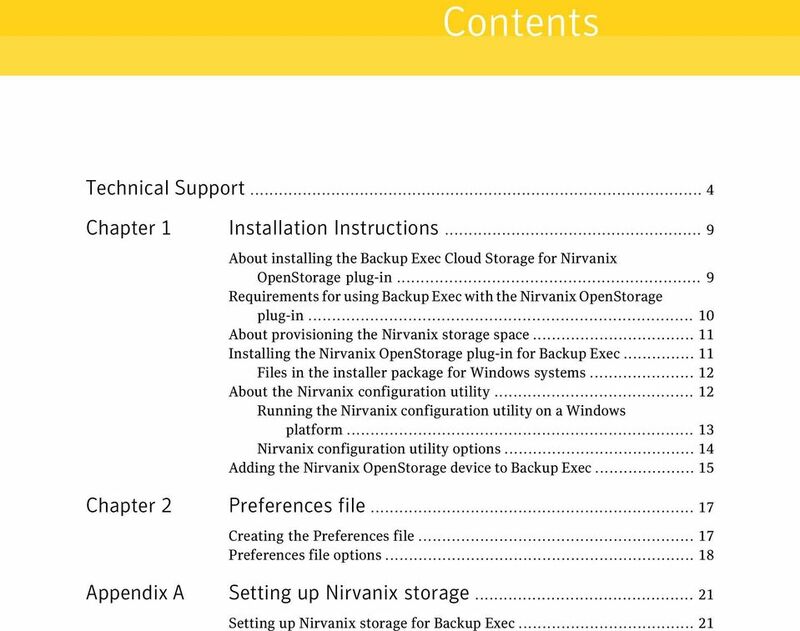 Use this installation guide to set up Nirvanix storage space and to install the Nirvanix OpenStorage plug-in package onto your Backup Exec server. Table 1-1 Installing the Backup Exec Cloud Storage for Nirvanix OpenStorage plug-in Step Step 1 Action Provision the Nirvanix storage space. More information See About provisioning the Nirvanix storage space on page 11. 10 10 Installation Instructions Requirements for using Backup Exec with the Nirvanix OpenStorage plug-in Table 1-1 Installing the Backup Exec Cloud Storage for Nirvanix OpenStorage plug-in (continued) Step Step 2 Step 3 Step 4 Step 5 (Optional) Step 6 Action Ensure that all requirements are met. Install the Nirvanix OpenStorage plug-in. Run the Nirvanix configuration utility. Add the Nirvanix OpenStorage device to Backup Exec. Create a preferences file to tune the Nirvanix plug-in. 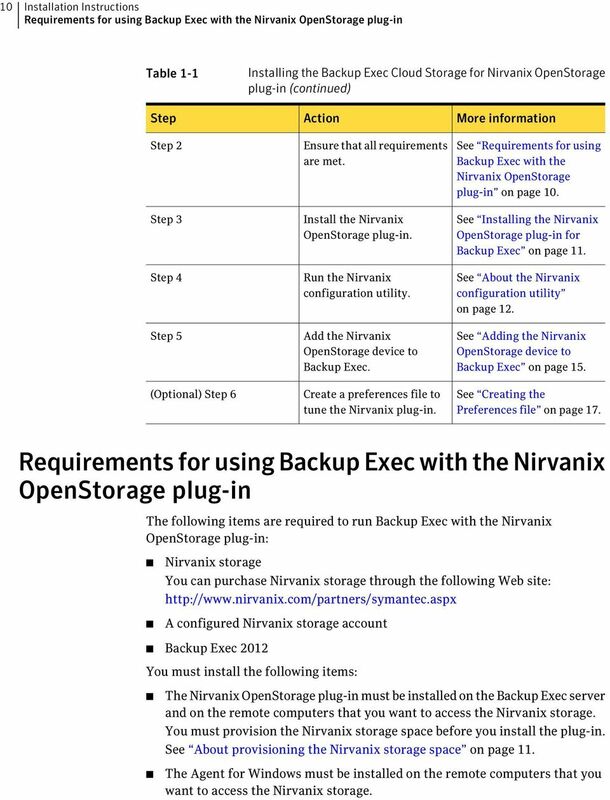 More information See Requirements for using Backup Exec with the Nirvanix OpenStorage plug-in on page 10. 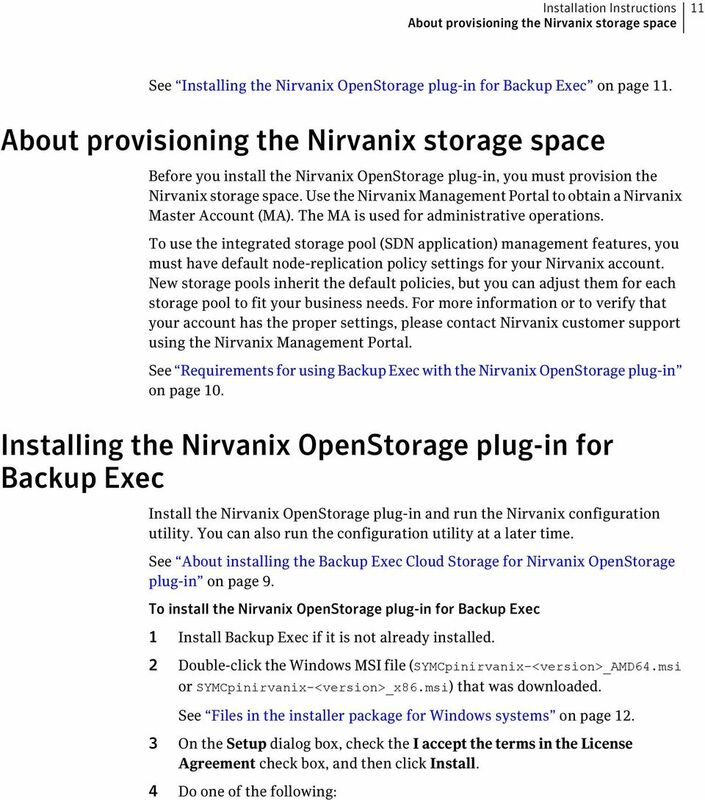 See Installing the Nirvanix OpenStorage plug-in for Backup Exec on page 11. 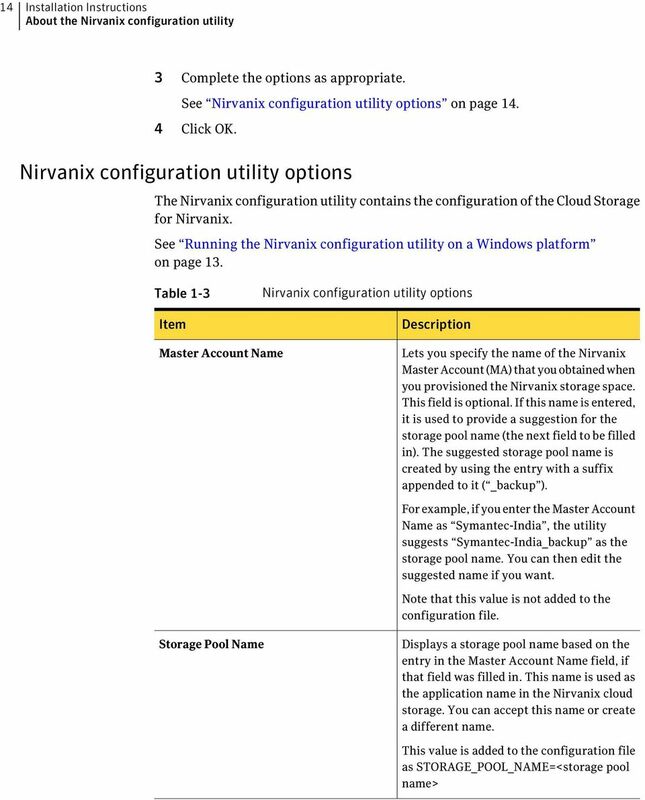 See About the Nirvanix configuration utility on page 12. See Adding the Nirvanix OpenStorage device to Backup Exec on page 15. 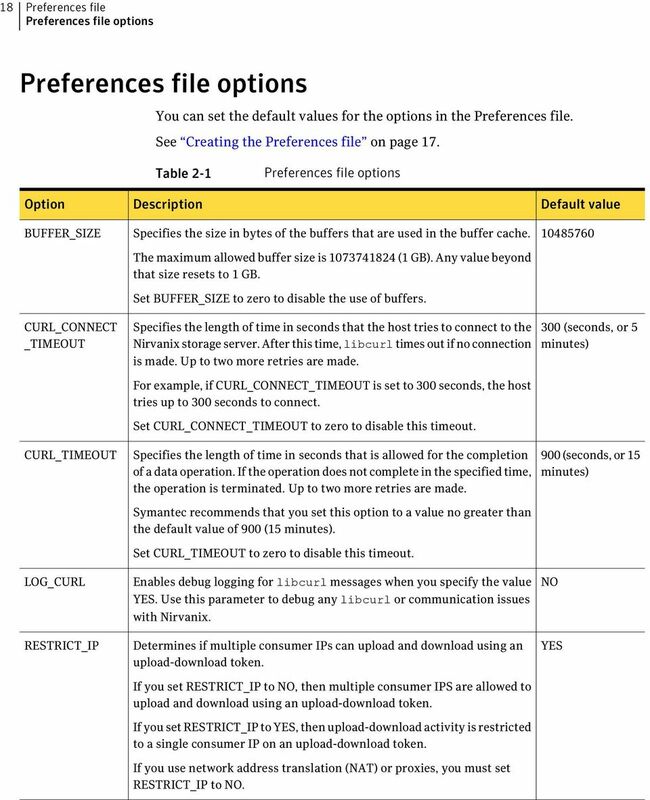 See Creating the Preferences file on page 17. Requirements for using Backup Exec with the Nirvanix OpenStorage plug-in The following items are required to run Backup Exec with the Nirvanix OpenStorage plug-in: Nirvanix storage You can purchase Nirvanix storage through the following Web site: A configured Nirvanix storage account Backup Exec 2012 You must install the following items: The Nirvanix OpenStorage plug-in must be installed on the Backup Exec server and on the remote computers that you want to access the Nirvanix storage. You must provision the Nirvanix storage space before you install the plug-in. See About provisioning the Nirvanix storage space on page 11. The Agent for Windows must be installed on the remote computers that you want to access the Nirvanix storage. 13 Installation Instructions About the Nirvanix configuration utility 13 C:\Program Files\Symantec\Backup Exec\libstspinirvanix.conf The Nirvanix configuration utility appears as follows: See Running the Nirvanix configuration utility on a Windows platform on page 13. Running the Nirvanix configuration utility on a Windows platform Run the Nirvanix configuration utility to enter values for the Nirvanix application and child account. See About the Nirvanix configuration utility on page 12. To run the Nirvanix configuration utility on a Windows platform 1 On the computer on which you installed the Nirvanix OpenStorage plug-in, go to the following directory: C:\Program Files\Symantec\Backup Exec 2 Double-click nirvanix_config.exe. 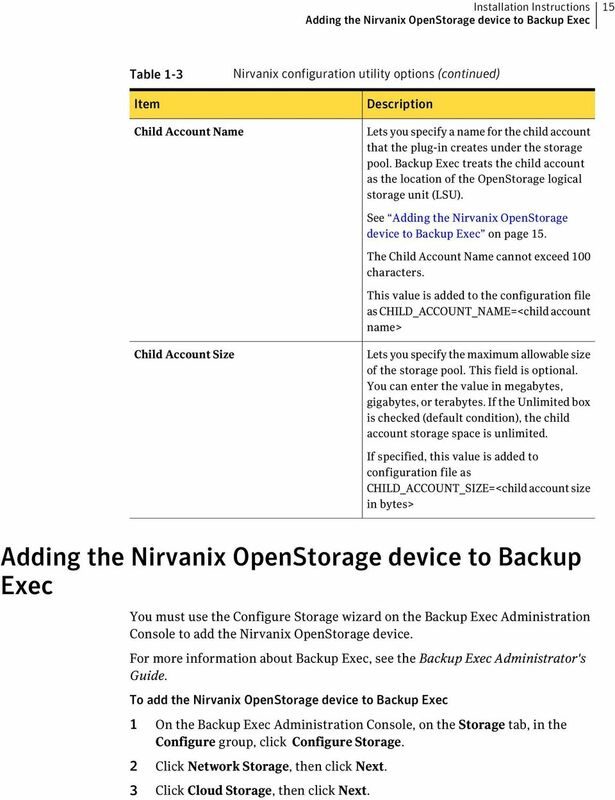 15 Installation Instructions Adding the Nirvanix OpenStorage device to Backup Exec 15 Table 1-3 Item Nirvanix configuration utility options (continued) Description Child Account Name Lets you specify a name for the child account that the plug-in creates under the storage pool. Backup Exec treats the child account as the location of the OpenStorage logical storage unit (LSU). See Adding the Nirvanix OpenStorage device to Backup Exec on page 15. The Child Account Name cannot exceed 100 characters. This value is added to the configuration file as CHILD_ACCOUNT_NAME=<child account name> Child Account Size Lets you specify the maximum allowable size of the storage pool. This field is optional. You can enter the value in megabytes, gigabytes, or terabytes. If the Unlimited box is checked (default condition), the child account storage space is unlimited. If specified, this value is added to configuration file as CHILD_ACCOUNT_SIZE=<child account size in bytes> Adding the Nirvanix OpenStorage device to Backup Exec You must use the Configure Storage wizard on the Backup Exec Administration Console to add the Nirvanix OpenStorage device. For more information about Backup Exec, see the Backup Exec Administrator's Guide. To add the Nirvanix OpenStorage device to Backup Exec 1 On the Backup Exec Administration Console, on the Storage tab, in the Configure group, click Configure Storage. 2 Click Network Storage, then click Next. 3 Click Cloud Storage, then click Next. 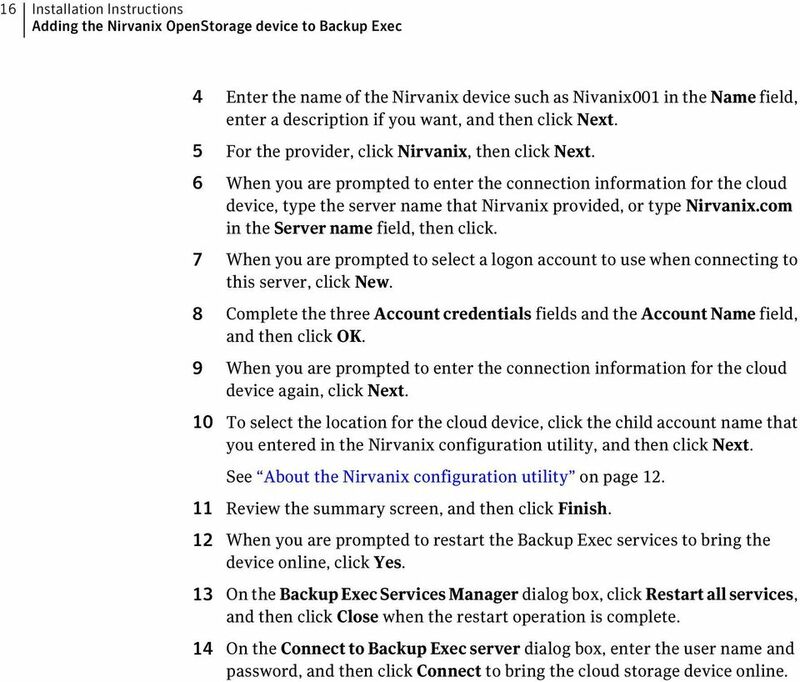 16 16 Installation Instructions Adding the Nirvanix OpenStorage device to Backup Exec 4 Enter the name of the Nirvanix device such as Nivanix001 in the Name field, enter a description if you want, and then click Next. 5 For the provider, click Nirvanix, then click Next. 6 When you are prompted to enter the connection information for the cloud device, type the server name that Nirvanix provided, or type Nirvanix.com in the Server name field, then click. 7 When you are prompted to select a logon account to use when connecting to this server, click New. 8 Complete the three Account credentials fields and the Account Name field, and then click OK. 9 When you are prompted to enter the connection information for the cloud device again, click Next. 10 To select the location for the cloud device, click the child account name that you entered in the Nirvanix configuration utility, and then click Next. See About the Nirvanix configuration utility on page Review the summary screen, and then click Finish. 12 When you are prompted to restart the Backup Exec services to bring the device online, click Yes. 13 On the Backup Exec Services Manager dialog box, click Restart all services, and then click Close when the restart operation is complete. 14 On the Connect to Backup Exec server dialog box, enter the user name and password, and then click Connect to bring the cloud storage device online. 17 Chapter 2 Preferences file This chapter includes the following topics: Creating the Preferences file Preferences file options Creating the Preferences file The Preferences file is an optional file that you can create to tune the Nirvanix OpenStorage plug-in. The default values are used if the Preferences file is not available or if you do not specify other values in the option file. The following are the contents of a sample Preferences file: BUFFER_SIZE= CURL_CONNECT_TIMEOUT=300 CURL_TIMEOUT=600 LOG_CURL=YES USE_SSL=YES USE_SSL_RW=YES To create the Preferences file 1 Create a file in the same directory where the Nirvanix OpenStorage plug-in is installed. 2 Name the file libstspinirvanix.pref. 3 Add the options that you want to use and the appropriate values. See Preferences file options on page 18. 21 Appendix A Setting up Nirvanix storage This appendix includes the following topics: Setting up Nirvanix storage for Backup Exec Setting up Nirvanix storage for Backup Exec The Nirvanix confguration utility automatically manages the storage setup. Use this procedure only for more advanced configuration such as when you want to create multiple child accounts. To set up Nirvanix storage for Backup Exec 1 Access the Nirvanix Management Portal Web site at the following URL: 2 Enter your Nirvanix master account credentials, such as symantec.dev7. 3 Click Applications, and then click Create New Application. 4 Enter a name. For example, use BackupExec-9 if the master account name is <Nirvanix_Customer_Account>. The naming convention ensures that the application (storage pool) names are unique within the Nirvanix global namespace. Nirvanix creates a unique application (storage pool) key for your application (storage pool). 5 Choose the application that you have created. 22 22 Setting up Nirvanix storage Setting up Nirvanix storage for Backup Exec 6 To create a child account that Backup Exec treats as a logical storage unit (LSU) under the storage pool server in Backup Exec, click Create New Child Account. 7 To set different quotas such as the maximum storage space on the child account, click View in the Details tab of the child account. 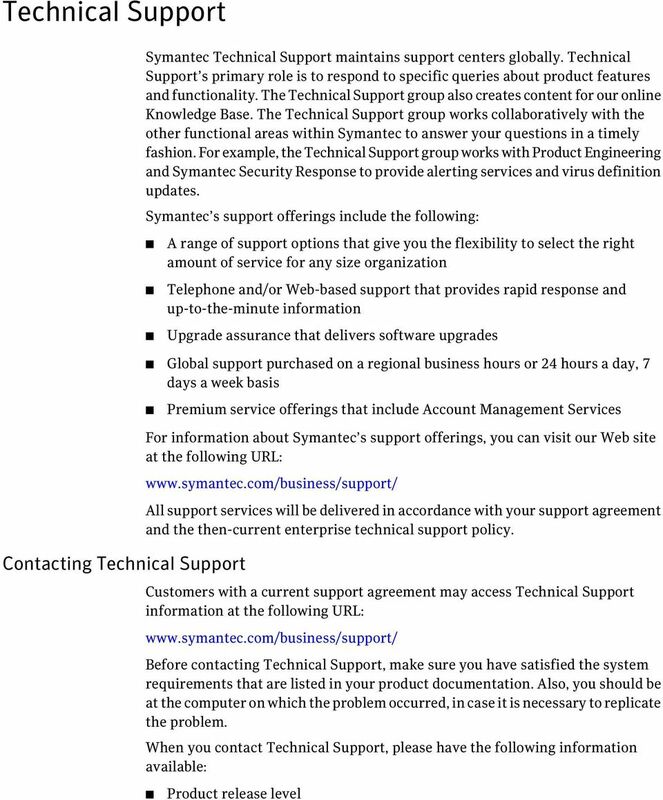 Symantec NetBackup Cloud Administrator's Guide Release 7.5 21220057 The software described in this book is furnished under a license agreement and may be used only in accordance with the terms of the agreement.